A new study, published in Food Control for June 2019, finds that meat and seafood recipes in some popular Canadian cookbooks do not provide adequate food safety information. The authors included 19 cookbooks that focused on meat and seafood. The study was conducted at the Canadian Research Institute for Food Safety in the Department of Food Science at the University of Guelph in Ontario. The evaluated cookbooks were published from 2015 to 2017. In 2017, another study published in the British Food Journal found the same thing; no food safety information or incorrect info. Overall, the study found that “cookbooks are not a good source of reliable food safety information or safe food handling practices, and they do not encourage the reader to practice safe food handling during preparation. More specifically, the study authors found that thermometer use is not encouraged, and the cookbook authors instead told the readers to use time, color and texture to indicate doneness. Those indicators are not a reliable test of doneness. Pink turkey can be safe, for instance, while turkey that is white could be underdone and dangerous to eat. The recipes lacked safe preparation, serving, and storage instructions, according to the study. And a full 96% of recipes provided incorrect safe temperatures, or no minimal safe temperature for doneness. This lack of critical information is especially dangerous now, when there is a JBS Tolleson ground beef Salmonella outbreak that has sickened at least 333 people in the U.S. In addition, there is an ongoing Salmonella Reading outbreak in the U.S. that is linked to raw turkey. That outbreak has sickened at least 218 people and hospitalized 84. 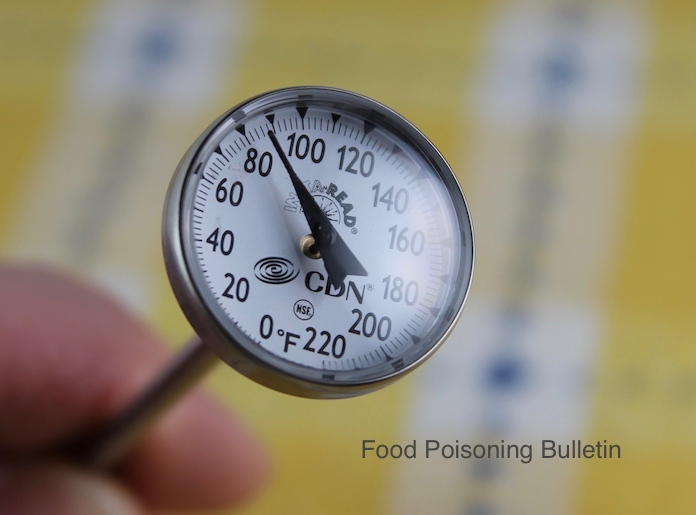 Proper cooking of meats and seafood to a safe final internal temperature is critical to avoid what could be a devastating illness. The study authors stated that Canadian cookbooks cannot be relied upon as a reliable source for food safety information. Canadian chefs and cookbook authors should be educated on safe food handling practices so they can promote good behavior in the kitchen.